Nine inches long, this is the largest trilobite fossil ever discovered in Minnesota. 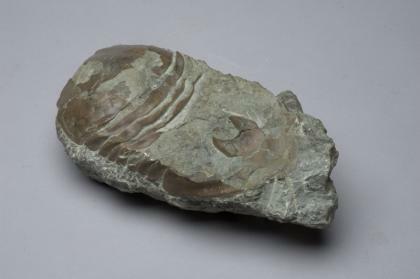 Most trilobites could fit in the palm of your hand. Ancient relatives of crabs and lobsters, trilobites flourished from 250 to 550 million years ago. Their remains are found on every continent. The original fossil, shown above, is missing the top of its head. Notice the mouth plate, the horseshoe-shaped piece on the fossil. In life, this would have been on the underside of the trilobite. Streamlined for plowing through the ocean floor, this species probably sucked up worms and other animals hiding in the sand. on level 3 of the Science Museum of Minnesota.